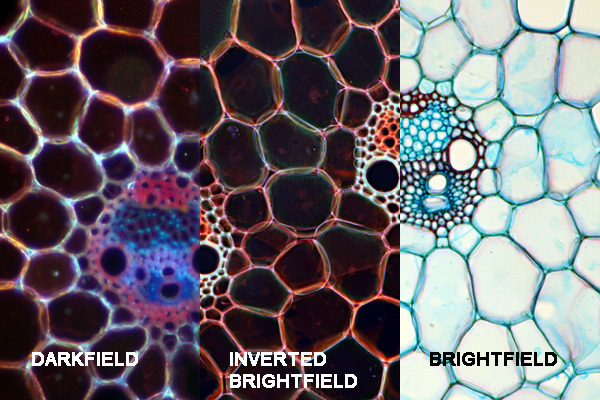 Darkfield microscopy is one of the simplest and cheapest contrast enhancing techniques. It works well for specimens that have a refractive index which is different from its surrounding medium, but which are difficult to see because they lack color. Dark field microscopy shows the specimen bright on a dark background. A darkfield filter (patch stop) placed into the filter holder of the condenser. To the left and the right are the centering screws. Potato starch grains. Left: darkfield image; Center: Brightfield, inverted colors; Right: Brightfield; The comparison shows that a darkfield image is not simply an inverted version of a brightfield image. Darkfield images have more sharply defined corners. Maize. Left: darkfield image; Center: Brightfield, inverted colors; Right: Brightfield; The darkfield image possesses less contrast due to the opened aperture diaphragm and a different color representation. To achieve a darkfield image, it is necessary to place a dark field filter (a “patch stop”) into the filter holder of the condenser. This filter prevents light of the lamp to directly enter the objective (therefore the background appears dark). The specimen will be illuminated from the side and will scatter some of the light to enter the objective. The specimen will appear bright on dark background. It can be compared to dust floating in the air with sun shining in from the side through a window. The dust is illuminated by the sun and appears bright on dark background. By using specialized darkfield condensers: This is the best but also the most expensive solution. By using a darkfield filter (a “patch stop”) which is placed into the filter holder of the condenser. It is possible to make the patch stop out of cardboard or a tin can using a cutting knife and scissors. It is a simple procedure which can be used on live transparent specimens, specimens which normally need to be stained (and therefore killed). The images appear spectacular and are visually impressive. Darkfield microscopy even allows for the visualization of objects that are below (!) the resolution of the microscope. These objects will appear as bright spots on a dark background. It is not possible to see the shape of these objects, however. 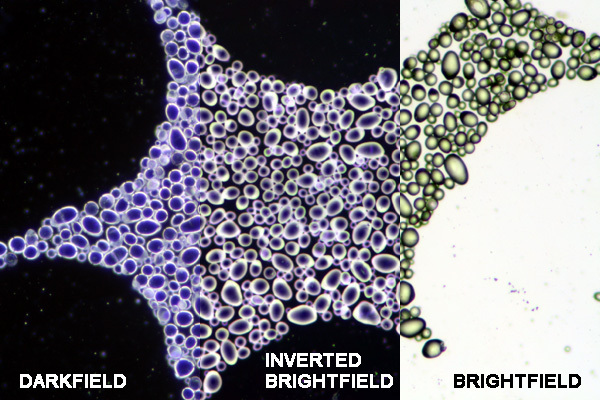 Darkfield microscopy is very sensitive to dirt and dust located in the light path. It is not suitable for all specimens. If the refractive index of a transparent specimen is similar to the surrounding medium, then the specimen light will pass right through the specimen and it will not be scattered into the objective. The intensity of the illumination system must be high so see the specimen properly. 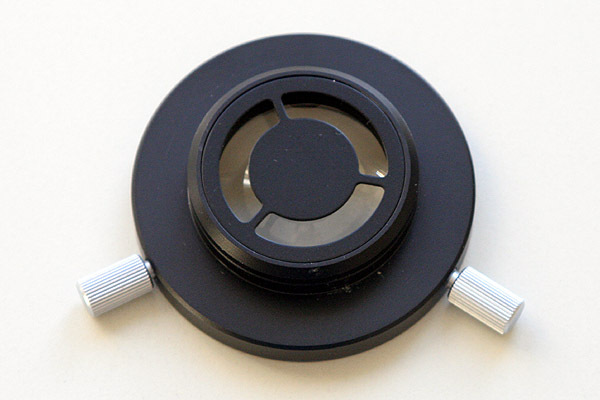 It is necessary to open the condenser aperture diaphragm, and this limits the effective use of the diaphragm. One patch stop is generally sufficient for low magnification work, but at a higher magnification the quality of the image drops. It may be necessary to experiment with different patch stop sizes for the different objectives. Once got a great magazine subscription re darkfield microscopy in 1990’s. I believe the name was EXPLORE. Professional research articles only, apparently on darkfield only. Please help me get in touch with the company. I have moved 10 times and to my great dismay, all the magazines were lost. Thanks!